The Governor’s Awards for History were presented at the annual history conference of the South Dakota State Historical Society that took place recently in Pierre. Barbara Johnson of Aberdeen was the individual award winner for her work in preserving stained glass throughout the state. Steve Olson of Watertown was named the 2014 History Teacher of the Year. He teaches at Watertown Middle School. Harl A. Dalstrom of Omaha, Neb., won the Herbert S. Schell Award for best article in the previous year’s South Dakota History, the State Historical Society’s award-winning quarterly publication. The article that appeared in the Fall 2013 issue of the journal was about the life and career of rattlesnake eradicator Albert M. Jackley. The Outdoor Campus of Sioux Falls and the Whitewood Public Library in Whitewood were organizational winners. The Outdoor Campus helps hundreds of area fourth graders learn about the Lewis and Clark Expedition. The staff of the Whitewood Public Library has gathered and filed historical information about their community in the Black Hills. 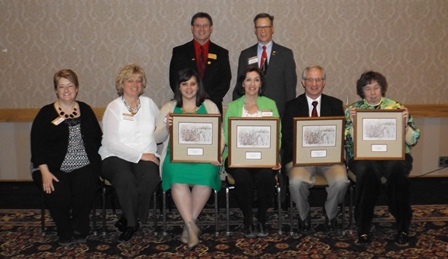 Pictured are award winners, seated from left, Thea Miller Ryan, director of The Outdoor Campus in Sioux Falls; Shelly Pierson and Hilary Fernolz, Outdoor Campus staffers; Rea Weyrich of the Whitewood Public Library; Steve Olson; and Barbara Johnson. In the back from left are Bard Tennant, State Historical Society board of trustees president; and Jay D. Vogt, State Historical Society director.